Saddle Shoes and Bobby Soxers - Youth and Nostalgia in the Twentieth Century. Often visually representing childhood, nostalgia and sub-cultures, saddle shoes are firmly placed within our popular culture. This article will briefly overview the history of the shoe and the role it has played in twentieth century fashion. It is reported that the first saddle shoe design appeared in 1906 when footwear designer A.G Spalding originally designed the shoes for indoor use. The saddle shoe is easily identified by its contrasting coloured leather ‘saddle’, most typically black over off-white leather uppers. The shoes were easy to clean with thanks to their rubber sole, inexpensive and durable to a degree. 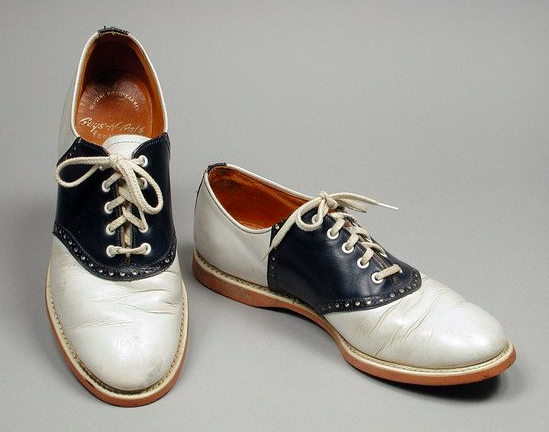 As saddle shoes gained popularity and were worn recreationally outside the gym, many health professional voiced concerned of the lack of support offered by the casual shoe. This did not stop the growth in saddle shoe wearers as by the 1930s, the shoes became an integral part of many a school uniform and, from this point onwards, created the everlasting link between saddle shoes and youth culture. By the 1940s teenagers began pairing the shoes with ankle socks, worn folded or slouched depending on the fashion at the time, known as ‘bobby socks’. The media coined the term ‘bobby soxers’, a group refering to teenage girls ‘addicted to adolescent fads and crazes.’ Although saddle shoes were often marketed as the all American shoe, the trend travelled across the pond. A participant in a study of Glaswegian women’s fashion during the 1950s fondly remembered how excited she was when she finally got herself a pair of saddle shoes. The lightweight, malleable nature of the shoes was championed by swing dancers and to this day the saddle shoe holds a close relationship with vintage sub-cultures such as rockabillies and lindy hoppers. As discussed above, saddle shoes have become synonymous with youth and nostalgia and are used often in film, television and art to symbolise this. 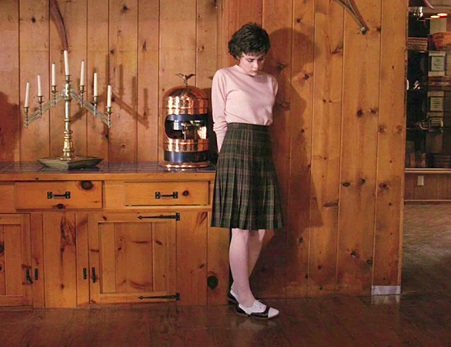 Costume designers often use the shoes to convey teenage innocence and vulnerability, for example Audrey Horne’s saddle shoes in the television series Twin Peaks (1990-1991). The shoes are used as a visual representation of Audrey’s adolescence and ties in with the nostalgic town of Twin Peaks. Films such as Moonrise Kingdom (2012) and Stoker (2013) also used the shoes to create a tangible hyper nostalgia throughout. This nostalgia was also evident in the latter half of the century. In 1972, journalist Judy Klemesrud noted in the New York Times ‘we've in a sense returned to the postwar period,…that period has become a fashion source for such things as sloppy Joe sweaters, plaid skirts and platform shoes.’ This association with nostalgia only seems to continue into 2018 with fads such as platform trainers, matching plaid suits much like those worn by the character Cher Horowitz, played by Alicia Silverstone in Clueless (1995), and body glitter now filling our online shopping baskets. Unlike these trends the saddle shoe remains a style staple throughout the decades, continuing to enjoy popularity whilst retaining their originality and authenticity. 1. Black saddle shoes by Hurd Shoe Co, Brooklyn Museum Costume Collection at The Metropolitan Museum of Art, Gift of the Brooklyn Museum, 2009; Gift of Kenneth S. Hurd, 1959 https://www.metmuseum.org/art/collection/search/156244. Accessed 27 Aug. 2018. 2. Schrum, Kelly (2011), ‘Oh the Bliss’: Fashion and Teenage Girl. In M. Forman-Brunell & L. Paris (Eds. ), The Girl’s History and Culture Reader: The Twentieth Century. 3. Participant D, interview by Casci Ritchie, participant’s house, June 9, 2016. Saddle Shoes designed by Guys-N-Gals, 1940s. Los Angeles County Museum of Art. 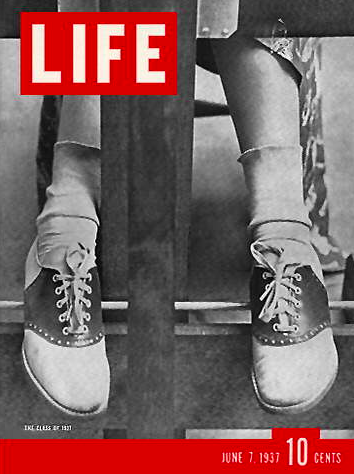 Teenager and Saddle Shoes, cover of Life Magazine, June 7th, 1937. Audrey Horne played by actress Sherilyn Fenn, Twin Peaks, 1990.